Walls are the perfect places to hang artwork and bulletin boards. But they are also excellent resources for extra storage in your home. Sacrificing some of the drywall for storage space means you won’t take up more than a couple inches of floor space, which is important when every inch counts! Additionally, going vertical can add zest to your décor, proving that it’s always smarter when fashion follows function. Interior walls are almost always built with stud framing covered by sheets of drywall. Because it’s the timber framing that provides the structure, the drywall is merely aesthetic. There’s lots of space between wall studs in which to insert shelves, cupboards, niches, drawers, and shallow hideaway places. There are plenty of how-to videos and articles on creating between-stud storage on your own, or you can hire a professional carpenter to give you a high-end look. 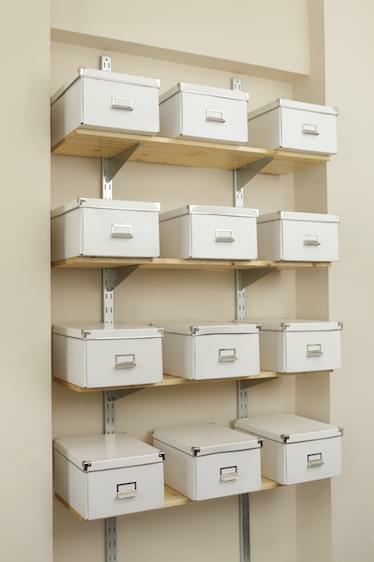 Check out Pinterest for some excellent examples of between-the-studs storage possibilities. Great idea: in small spaces, tables take up a lot of room. A between-the-studs cupboard that holds a hideaway table allows you to fold down the tabletop and supporting leg whenever you need it—and get it out of the way when you don’t. Pegboard isn’t just for garage workshops, and wall trellis doesn’t have to be confined to outdoor gardens. Both of these materials can be attached to interior walls for super storage options. Pegboard is especially helpful in a kitchen, crafts room, or bedroom. Paint the board to match the wall color or in a complementary shade to make it stand out. Attach screw-in hooks to hold appliances, baskets, jewelry, stuffed animals, clothing, or anything else you want to keep up and off the floor. Trellis works a lot like pegboard, but it comes in some fantastic styles and colors, making it more showy for public living areas. Buy s-hooks to attach baskets, hanging plant holders, and more. Wall shelves are always an option, but if wall space and floor space are both limited, try attaching shelves up near the ceiling. Shelves above doorways or that span a length of wall about a foot under the ceiling won’t interfere with head clearance (assuming you have the standard 8’ ceilings or higher). They also add lots of space for pictures, collectible plates, books, baskets, or small bins to keep stuff organized and out from underfoot. Finding extra storage space is always smart and conducive to an organized, tidy home. If you still have too much stuff for your space, consider self storage units from Value Store It. Our multiple locations throughout Florida, Connecticut, and New York mean you can find the perfect self storage unit at a secure facility to suit your specific needs. Visit our Homepage today, where reserving a unit is easy.